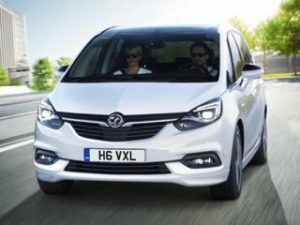 The Vauxhall Zafira Tourer has received its mid-life update for 2017, the front of the car has taken its cue from the Astra and has a more upmarket detailing and a distinctive headlight design. Internally the button crazy dash is replaced with a clear layout dominated by the seven inch touchscreen. OnStar, the in car personal assistant, is now added across the range for the duration of your lease, the much advertised in car wifi is free for the first three months only. The new Zafira Tourer retains the excellent Flex 7 seating system which has three individual seats in the middle row that all fold flat, recline and slide, sadly the middle seat is smaller than the others so if you need more than booster seats it will be a struggle, in Elite trim you can fold the middle seat to make a central armrest for the two outside seats which we like a lot. The rear two seats are cramped and only suitable for children but are quick to set up and do fold flat into the boot. 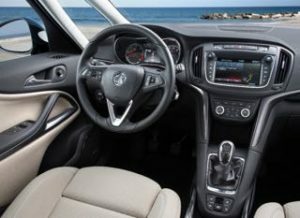 The driving position and visibility are excellent and the Zafira Tourer lives up to its name and makes for a super long journey car, ride and comfort are a joy. The Zafira Tourer is direct competition for the Peugeot 5008, Volkswagen Touran and Ford S-Max in the medium sized occasional 7 seat market. Design, Energy, Tech Line, SRi, SE and Elite trim lines are available for the Zafira Tourer. The Design is well equipped with 17 inch alloy wheels, black roof rails, front centre armrest, steering wheel audio controls, usb and bluetooth, air conditioning, front and rear parking sensors, LED daytime running lights and cruise control, The Energy trim adds a sat nav, front fog lights, dark tinted rear windows and silver roof rails. The SRi has 18 inch alloy wheels (apart from 1.6 diesel) sports seats and leather-covered steering wheel, SE trim has rain-sensitive windscreen wipers, 17″ Alloys, electronic climate control and ambient lighting in front doors. The Tech Line is the SE trim plus Sat nav. The range topping Elite has 18″ alloy wheels, leather seats, heated front seats, driver’s seat tilt and four-way electrical lumbar adjustment, panoramic windscreen and panoramic sunroof. There is a single Petrol engine; 1.4 litre 140bhp petrol turbo offers quite disappointing combined economy of 44.1 miles per gallon but it can reach 62mph in 9.9 seconds and on to a top speed of 126mph top speed. Given the low levels of economy this engine is only recommended to those that do relatively low miles. Vauxhall are withdrawing the Zafira from their range and there are no more being built, the only cars avaialble are stock cars.